Framed black and white poster commemorating the sinking of the Empress of Ireland, May 29, 1914. The exhibition is called Canada’s Titanic – The Empress of Ireland. 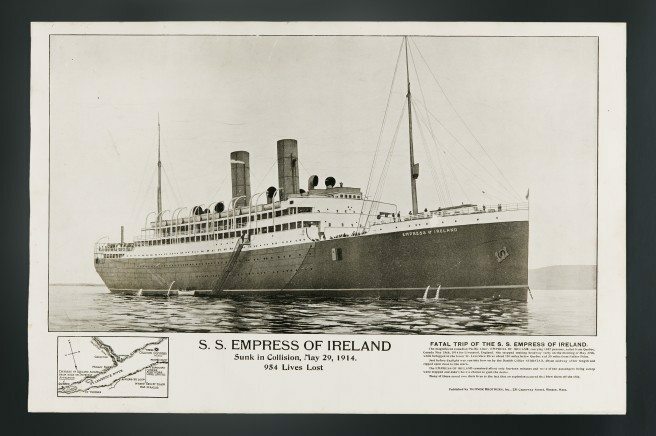 It opened on the 100th anniversary of Canada’s most tragic peacetime maritime disaster: The CPR ship, The Empress of Ireland, sank in the early hours of May 29, 1914 in the Gulf of St. Lawrence near Rimouski, Quebec. Of the 1,477 people aboard, 1,012 died, including 133 children. 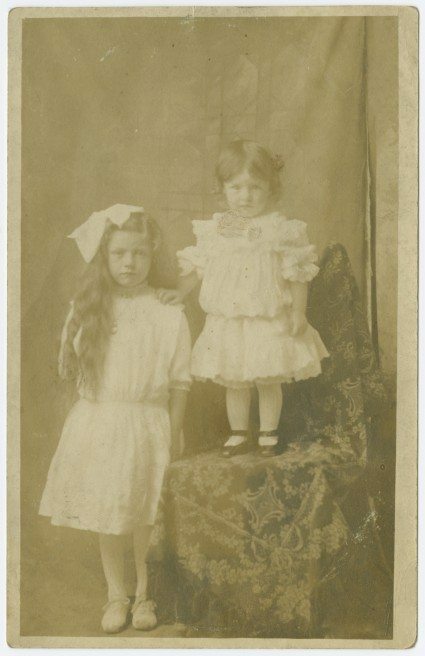 Florence Barbour (Second class) , Travelling with her mother, Sabena, and her sister Evelyn. Fate: Florence Barbour: Survived. Sabena Barbour (mother): Perished. 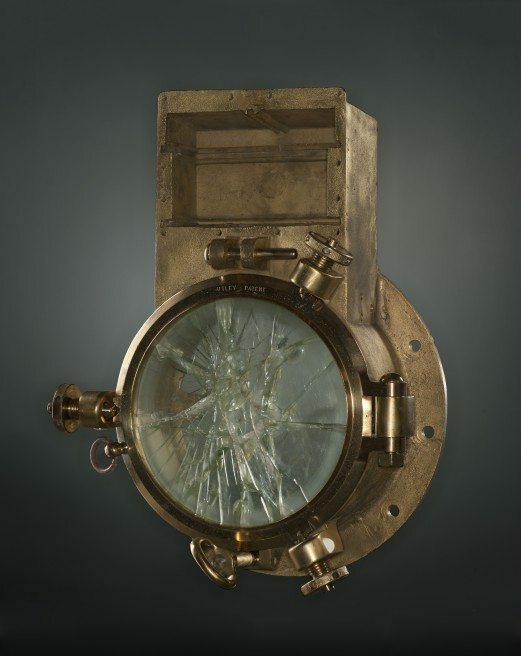 The story of the ship and its sinking is told in an exhibition rich in artifacts, photos, first-person accounts, drama, sorrow, and just the right amount of informative text panels. It is such a rich experience — a great big multi-media window into our past, our history —that it will become the gold standard for future historical exhibitions at this federal institution. The Empress of Ireland left Quebec City May 28, 1914 at 4:30 p.m., 90 minutes late, bound for Liverpool in England. It was the beginning of the ship’s 96th trans-Atlantic voyage. 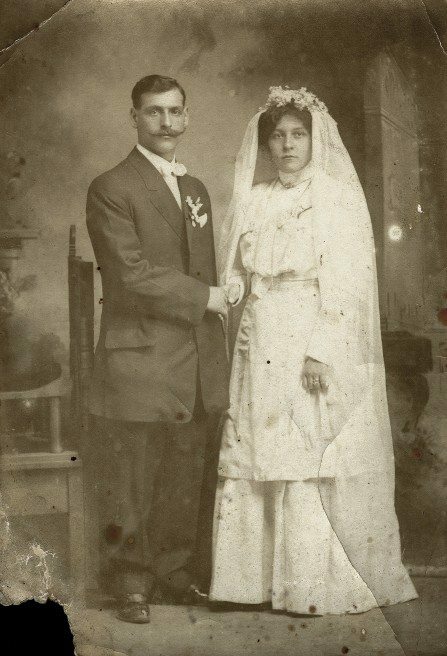 Since its first crossing in 1906, the Empress had brought 100,000 immigrants to Canada. That means wide swaths of Canadians today have a familial link to that doomed ship. 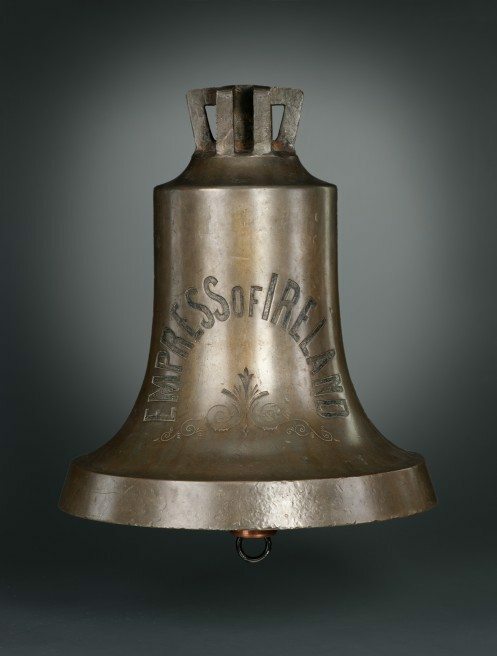 Fog Bell of the Empress of Ireland, the “piece de résistance” of the CMH collection. Artifacts from the ship in the exhibition include many acquired in 2012 from a private collector and diver, Philippe Beaudry. They include the ship’s bell, fancy china, menus, various brass fittings, bathroom fixtures and mail being carried by the Empress. Audio recordings relay first-person accounts by survivors and by those who mourned them. Period photographs, newspaper stories, and other bric-a-brac from the era supplement the artifact collection. 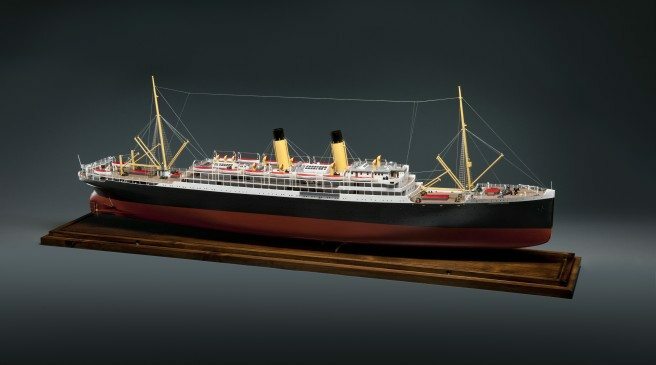 Model of the Empress of Ireland; note the wire stretching between the masts fore and aft which allowed radio operators aboard the ship to communicate with other vessels and wireless stations. The passengers travelled in first, second, or third class. The first class passengers had luxurious suites with private bathrooms, their own dining room, music room, and library. They were served dinner at 7 p.m. Second class ate at 6 p.m. Third class had to wait, sometimes until 9 p.m. 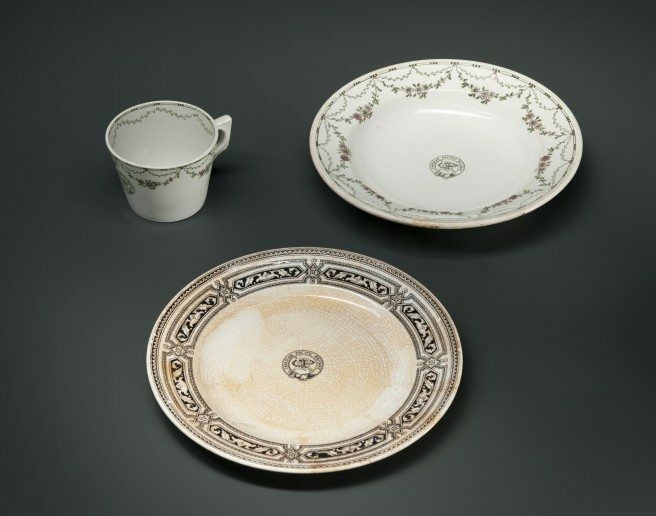 Selection of first and second-class dishware from the Empress of Ireland. Third class items were far less embellished. After dinner on the evening of May 28, a group of Salvation Army members en route to a convention in England gathered around a piano in the social hall next to the second-class dining room to sing songs. The less pious headed to the bar or smoking room. Two poker games continued until midnight in the first-class lounge. At 12:50 a.m. on May 29, the ship encountered fog in the St. Lawrence and reduced speed. Less than an hour later, the Norwegian coal vessel the Storstad was spotted almost 10 kilometres away. The fog worsened and, at 1:55 a.m., the two ships collided. The exhibition provides a dramatic minute-by-minute account of the trajectory of both ships. Porthole of the Empress of Ireland, the damaged glass tells a story. The Storstad tore into the starboard side of the Empress to a depth of 5.5 metres. The result was a gaping, 32.5-square-metre hole. The force of the impact killed several passengers instantly. 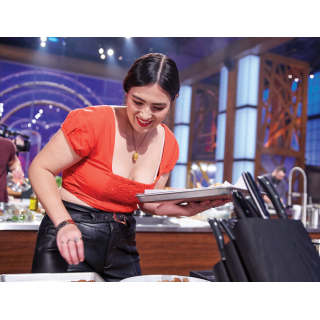 Within 15 minutes, the Empress sank. An inquiry called soon after placed most of the blame on the Storstad. 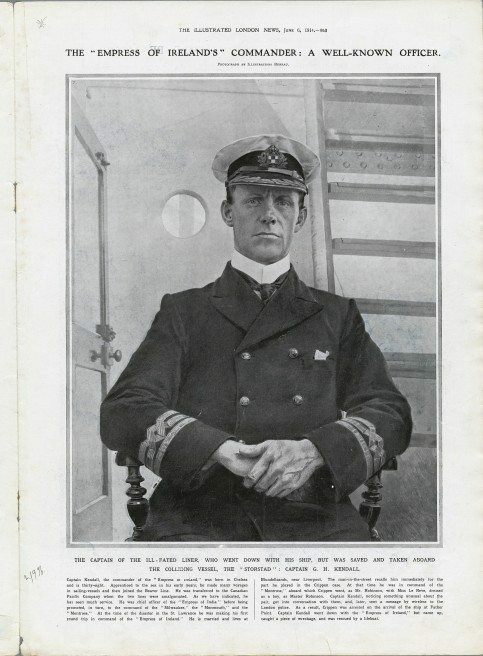 Henry George Kendall , Captain. Fate: Survived. The Commission of Inquiry supported his version of events, blaming the captain of the Storstad for the catastrophe. The chances of survival for the Empress passengers depended upon where they were housed on the ship. The higher up, the better the chance. Thus, 41 per cent of those in the higher first-class rooms survived. Only 19 per cent in second and third class lived. The townsfolk of Rimouski turned out en masse to help the survivors, offering dry clothes, food, and shelter. The dead were piled in a commercial hanger at the wharf. Note of warning: the exhibition includes a horrific, enlarged photograph of the bodies in the hanger. 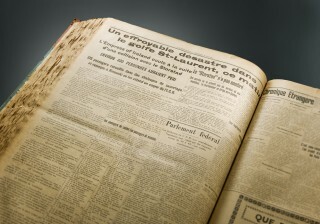 News headline on the sinking of the Empress from l’Action sociale, 29 May 1914, published on the day of the disaster. The exhibition is a joint project with the Halifax-based Canadian Museum of Immigration at Pier 21. Expect to see more cooperation between the retooled Gatineau museum and its provincial and regional counterparts across the country. And no, the museum will not just be showcasing Canadian history, despite all the predictions from those opposed to the remake of the civilization museum. Next summer, the main exhibition will be The Greeks – From Agamemnon to Alexander the Great. It will include 500 treasures from Greek antiquity, including a bust that is the only known image of Alexander the Great created from life. Canada’s Titanic – The Empress of Ireland continues at the Canadian Museum of History until April 6, 2015.